If you would like to find out more about the video editing class I will be teaching for PV NET starting May 3rd, checkout the video I posted on YouTube. If you are on Facebook, please click on the LIKE button in the upper right hand corner of this page. Thank you. I’m teaching a basic video editing class beginning May 3rd for PV NET. If you have been waiting to register, their online registration link is now available. CLICK HERE to go directly to the form. If you would like to find out more about the class, use THIS LINK. Remember, laptops are welcome, and now PV NET’s computers have Windows 7. If you have recently upgraded your digital camera to a digital single lens reflex (DSLR) model or similar advanced camera, you probably are somewhat intimidated by all of its new modes and settings. Understanding Shutter Priority (Tv), ISO, Aperture Priority (Av), and Manual shooting modes is not always easy. Certainly the best way to learn about these settings is to shoot pictures – lots of pictures – while taking notes so that you can intelligently compare the results. Another way is to simulate the these changes. I learned about a very cool website that does exactly that this past week. I was led to this site from the Digital Photography School in an article by Peter West Carey http://digital-photography-school.com/technical-flash-applets-from-stanford-university-make-photography-learning-fun-2. This link takes you to a webpage that has some very technical articles about the underlying principles. But, there you can also link to a real cool applet on this webpage http://graphics.stanford.edu/courses/cs178-11/applets/exposure.html. This is where the fun begins. Instructions on the page tell you how to use the applet. Here is how the applet looks on your screen. 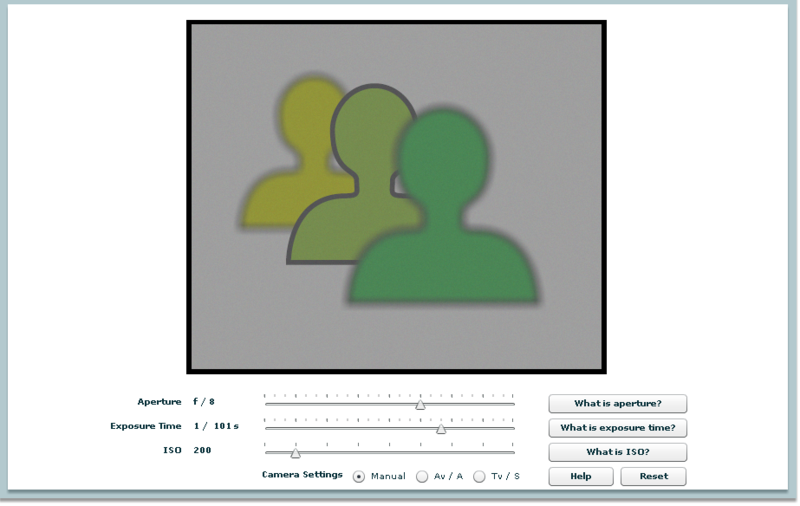 To use the applet, simply move the sliders and watch how the focus and brightness of the three figures vary. You can simulate the various shooting modes of Manual, Av and Tv, as well as ISO. To get you started, set the ISO to 400, Aperture to f/16, Exposure Time (Shutter Speed) to 1/64 sec using the Manual setting at the bottom. Notice that while the middle figure is the sharpest, the ones in the back and front are also reasonably sharp. This is because the depth of field – that region in front of and in back of the subject of focus is relatively large at this small lens opening. Change the the ISO to 100, the Shutter Speed to 1/250 sec., and the aperture to f/2. Now only the center figure is in focus. The depth of field has gone way down, because we have made the lens opening quite large. You can also, simulate the the Av and Tv modes. Playing with this applet can be quite engaging and fun. If you are on Facebook and liked this article, and have not so already, click on the Facebook page icon in the upper right corner of the screen. When you use higher ISOs in your camera or employ very long shutter speeds, the electrical noise generated by the camera becomes visible. In many respects this is very similar to the grain we saw using high speed films in conventional cameras. There are two types of electrical noise you may see in your images, mono-chromatic noise, and chromatic noise. Mono-chromatic noise is visible as black and white speckles in your image, whereas chromatic noise are the multiple-color spots. Basically all noise reduction software and techniques use some sort of blurring to reduce the visibility of the noise. But they generally come with a price. There can be a loss of sharpness. Reducing mono-chromatic noise is more of a challenge that reducing chromatic noise. The article linked below describes how to use Photoshop or Photoshop Elements to easily reduce any chromatic noise in your image without compromising its sharpness. The article was published on www.digitalphotopro.com and was written by John Paul Caponigro. The next time you have one of your night shots taken with a long shutter speed or had to push your ISO to the upper boundaries of your camera’s capabilities, try this technique. Remember it’s targeting the chromatic noise in your image. Leave a comment and let me know how it worked for you. If you’re on Facebook, please Like my Facebook page in the upper right corner. Thanks a lot. I strongly suspect I spend more time exploring the net for digital photography information than many of you are able to do. So I am going to pass on some of the best material I’ve come across from the many sites I frequent. As you begin to away from using the Automatic setting on your camera, you may begin to play with its Shutter Priority or Tv mode. In this mode, you select how long the shutter stays open to gather the light, and the camera internal sets the F/Stop or Aperture (how wide the lens is opened) to ensure a well exposed picture. The article below describes how to select the best shutter speed to use. One of my favorite sites for just about everything related to digital photography is www.Digital-Photography-School.com. Below is the link to a recent article posted there on the subject.